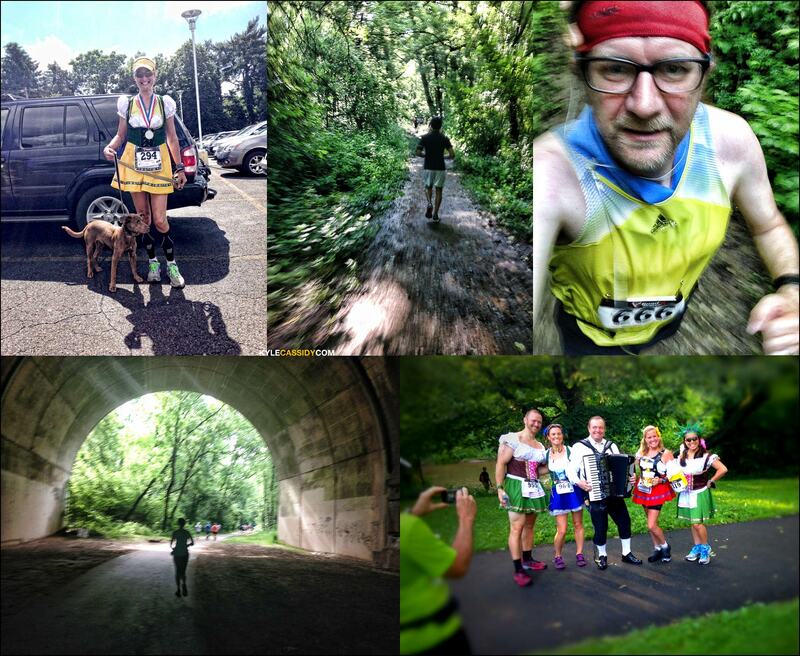 I ran an accidental half marathon this weekend, which might seem a little strange. Someone on the Internet who I thought was one of the West Philly Runners injured herself on Wednesday and had a spare bib for this odd race in a park in North Philly called the "1/2 Sauer 1/2 Kraut half marathon". It was ... German themed and they encouraged people to dress up in lederhosen and promised bratwurst and an accordion player named Uber Hans who used to be a professional football player for the Seattle Seahawks. Anyway, it sounded like fun, even though I'd just run a half marathon the week before. I'd read on line that the course was "challenging" and had a lot of hills, so I decided not to run it hard and to have fun, which turned out to be the right decision, there were some insane hills covered with mud and rocks and it was like running through the set of Predator for a good part of it. The surfaces were partially paved, then partially just grass, then partially muddy trails, and then there was this thing they called "Cuckoo mountain" which, I didn't get much of a chance to see because I was staring at the shoes of the woman in front of me, hoping she was making wise choices about foot placement as we ran up the side of this muddy monster. It was terrific fun, there were lots of people who dressed up. I ran it slow (ish) in 2:04, which is seven minutes slower than my Personal Record, and it's amazing how seven minutes over thirteen miles is the difference between going blind at the end and trotting over the finish line with a smile and a wave. I came in around 250th out of 675 which is a happy place for me to be, at the front of the mid-pack. It was a fun race, advertised as the "hottest race in Philly" because, well it's in freaking June which turned out to be OK. Almost the whole course is in the shade and I was experimenting with this space towel thing that's supposed to stay wet all the time and keep your neck cool (review: it actually seems to work), plus I wasn't running fast. The after party had vegan bratwurst and beer, plus Uber Hans playing the according with a wireless. The only downside was that it's waaaaay out in the middle of nowhere (hence all the pretty trees). I'd do it again next year, but I'd want to carpool. Okay, we'll give you "awesome" or "crazy" for this. Any idea how hot it actually was? It was 74 degrees. and sunny. Okay. I feel better now. I've learned I have to cut back or stop when it hits 80, and was kind of feeling (a) old and (b) wimpish. 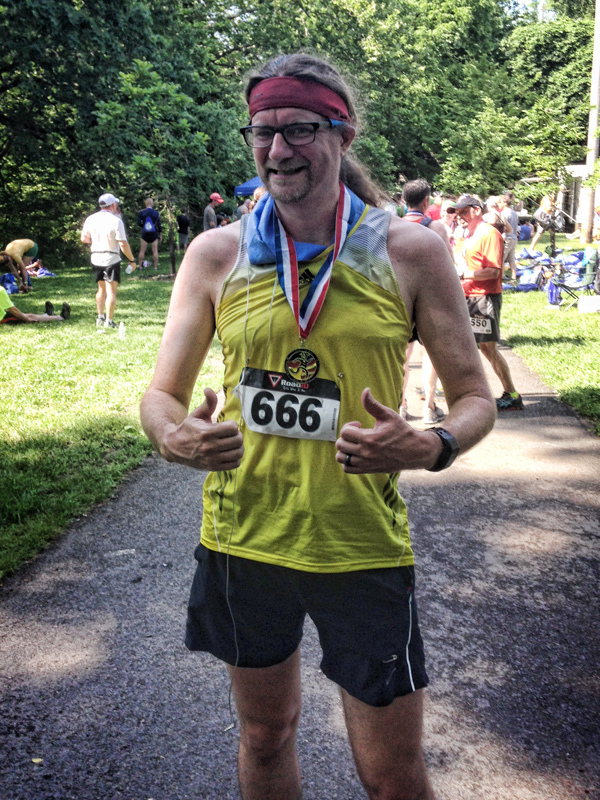 The runner of the Beast! Yes, yes. Tell us about the magic space towel! I got it from some add in competitor magazine. was like "science towel that never dries out!" or something. it was like $10 and was way too big, so i cut it in half. you just stick it in a ziplock bag when you're done. it doesnt actually stay wet forever, but for a long time, like days. It did make my neck feel cooler.